Hi, it's Caro, the pet therapist from the Pampered Pets mystery series. I don’t know about you all but I for one love the fresh start of a new year! I love thinking about the possibilities that lay in the months ahead and I especially love the blank pages of a new calendar. But then I’m a bit of an office supplies geek and January offers a great opportunity to shop for fun things to help me get organized for the year. There’s the need for a new calendar, maybe some folders, and, of course, notebooks. Why I’m just like a kid in a candy store! This year I picked up an adorable wall calendar from our local animal shelter, which means I not only ended up with a great calendar but I was also able to support a great cause. I also grabbed some colorful paperclips, a couple of notebooks and a couple of adorable dachshund pens. I'll clear out old files and set things up for the new year and add standing appointment to my new calendar. How about you? Do you love getting organized for the year ahead? Do you have to have that special calendar or notebook to start the year? Or is there something else you do to get you started off on the right foot? You might have noticed the dachshund theme in my shopping. 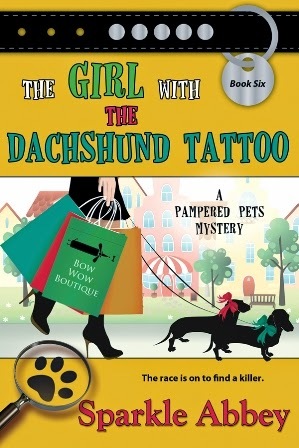 That's because the latest adventure in the Pampered Pets Mystery Series is The Girl with the Dachshund Tattoo. I wish you a wonderful 2015 and I hope that your new calendar is filled with all sorts of exciting things to do! A friend and I are long-time office geeks and have been forever giving each other that perfect (often goofy) pen, sticky pad, calendar, clips, tabs. We thought we might outgrow it but apparently not. I use an online calendar program for everything I want to remember, a desk calendar I can scribble on, and a distilled version of that for the family appointments that sits on the corner of the table. We usually have at least one Pug-themed calendar or notepad at our house. Glad to hear from another office supply geek! :-) There are just so many fun things to choose from. To start the new year I always start with a clean desktop. it's surprising what I find at the bottom of those piles on my desk. A clean desktop is a great idea. You find things and you start fresh! I go through my files and remove unnecessary documents. I am always surprised by how much needs to be throw away. Wow, Jen, that's a great beginning of the year project. Otherwise files just continue to grow. Great ideas to keep on task and motivated! Don't you just love the way the perfect pen glides across the paper? A planner is a great way to keep organized and also perfect to look back on the year and see exactly what happened the past 12 months. Mailman just dropped off my new calender as I was reading this post. It is the Bite by Bite system with an elephant on the front. It has system for setting goals. Plan to use it for my novel. A novel is a big project but like eating an elephant it can be done one bite at at time. I too love office supplies. Virginia, that Bite by Bite system sounds perfect! Love that it has a goals setting system. Sounds perfect for us writers. Always 2 new calenders--one for the kitchen and one by the computer. Anymore there are so many fun calendars, it's hard to pick just one. The calendars with the inspirational quotes can be very motivational. Thanks for commenting, Libby! Love picking out new calendar for they year. I too bought one from a rescue (Hunks & Hounds). Think I will be looking at it often ;) New notebooks for fresh ideas. And a box of crayons to help relax and get creative juices flow. Hunks & Hounds! Love it!! I am an office supply geek took. My father got me started on that. We used to go together to buy stuff for the office. I love my big pottery vase that is just the right size for a variety of pens and pens and a pair of scissors. Have a tape dispensor, stapler and body lotion on the next. Also love colorful spreadsheets for keeping track of my TBR books. Carol - We think a big pottery vase sounds like fun. We haven't tried spreadsheets for the TBR books but it sounds like a great idea! We'll drop you an email so you can send us your mailing address.